The Paradise Beach Cabana is the perfect addition to your beachfront or pool. The folding canopy offers an infinite number of positions for maximum sun exposure, shade when partially closed, or privacy and security when fully closed. The Cabana utilizes tension adjustable cushion supports and 5 position elevating backrest. The canopy rear window and side panels roll-up for ventilation. Cabana comes in an easy to complete "pre-assembled kit." Frame made from the highest-quality, UV-stabilized polyvinyl chloride (PVC) resin tubing. This material will not chip, dent, stain, peel, fade or sustain bacterial growth. 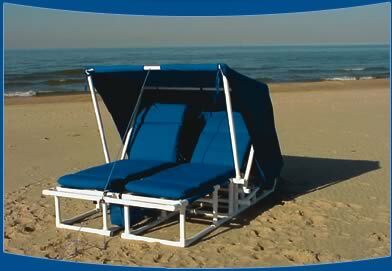 The cushion set and cabana folding canopy are made from UV-stabilized, poly-olefin woven fabric. Available in 4 colors: Royal Blue, Navy Blue, Forest Green, and Antique Beige. Custom colors and materials available upon request.